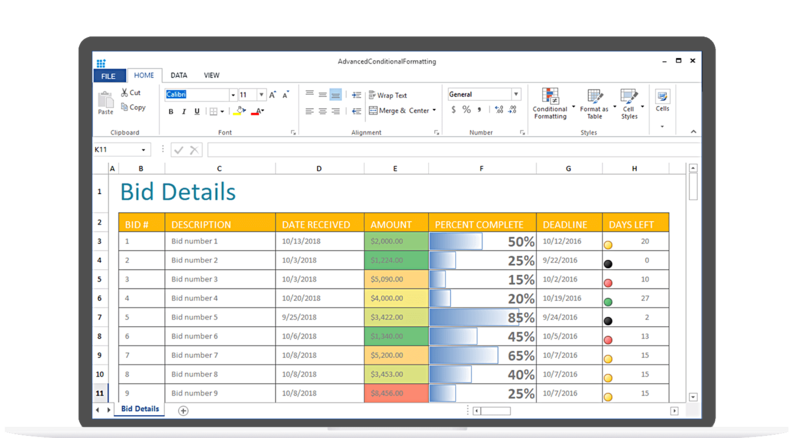 The WinForms Spreadsheet control allows users to create, view, edit, and format Microsoft Excel files in their applications with integrated ribbon. The WinForms Spreadsheet Control is an Excel-inspired control that allows you to create, edit, view, and format Microsoft Excel files without having Excel installed. It provides an integrated ribbon to cover any possible business scenario and easily maximize it. In addition, it supports built-in calculation engine with more than 400+ of the most widely used formulas. It is built with .NET Excel library (Essential XlsIO), which features a full-fledged object model similar to the Microsoft Office Automation libraries. Read and write all popular Excel file formats, including XLS and XLSX. A file can be opened in one format and saved in another format. The spreadsheet ribbon provides a familiar, Excel-like user interface to help end users work with Excel files. The ribbon can easily be customized to manipulate Excel workbooks based on application requirements. Allows you to create your own ribbon or toolbar to manipulate Excel workbooks using predefined commands of the control. Instant loading - Load and manipulate Excel-like workbooks with a large amount of data and any number of worksheets in less time with minimal memory consumption. Smooth scrolling - Provides a smooth scrolling experience even with many cells in the view. Formula calculation - Fast and efficient calculation engine with more than 400+ Excel-compatible functions. Data editing - Allows adding, editing, and removing formulas in a cell. Additionally, users can select the range reference directly using a mouse or keyboard when entering formulas, just like Excel. Data validation - Validate the edited values based on the data validation rules defined for a cell or range of cells. Data validation can be applied with operators, alert messages, custom formulas, and drop-down lists. Undo and redo - Undo and redo changes can be made in an Excel workbook. Similarly, there is no limit to the number of undo and redo operations in spreadsheet. Clipboard operations - Allow users to enable Excel-like paste option to paste a value or formula with or without formatting. Drag fill - Easily fill or copy a series or pattern of values and formats in the neighboring cells in any direction. Provides built-in support for hyperlinks and bookmarks. Additionally, supports navigation through bookmarks to a specific cell or range of cells in a workbook like Excel. A wide range of formulas is available with cross-sheet references, named ranges, table formulas, and array formula support. Built-in functions - The built-in calculation engine is preloaded with more than 400+ Excel-compatible functions covering a broad range of business scenarios. Auto calculation - Cell values are recalculated when a precedent cell is edited. Named ranges - Named ranges can be used in formulas as substitutes for cell references. The built-in name manager allows you to add, edit, and delete names. Font - Import and modify various font formatting options like font size, font family, font styles, font color, and fill color. Align and merge cells - Import and modify various alignments, merged cells, and wrap settings from Excel. Number formats - Import and modify number formats such as currency, percentage, short date, long date, time, fraction, scientific, and custom number formats similar to Excel. Table formats and built-in styles - Import table formats and predefined cell styles from Excel. You can also format a range as a table and define cell styles at runtime. Cell formatting - Support to insert, delete, hide, and unhide one or more rows and columns in worksheets. And support to adjust the row height and column width, import the adjusted row height and column width from Excel, fit rows and columns based on the content. Additionally, support to freeze a row, a column, and rows and columns in worksheets. Helps you to visually explore and analyze data, detect critical issues, and identify patterns and trends. Conditional styling - Format the appearance of cells based on their value or values of other cells. Data bars - Use gradient or solid data bars to easily spot the largest to the smallest numbers. Color scales - Use color scales to understand data distribution and variations. Icon sets - Icon sets distinguish data in three to five categories based on the threshold value. Import outlines and group or ungroup rows and columns at runtime. Charts - Import charts from Excel that can be defined at runtime. This helps visually enhance the represented data. Sparklines - Import sparklines from excel to visually represent data in a row. Pictures - Import images from Excel and add images at runtime to the spreadsheet. Users can also resize and reposition the images. Textboxes - Import rich text box from Excel and add it at runtime for editing formatting content. Users can also reposition the rich text box. Touch optimized - The spreadsheet control is touch-optimized for all user interactions like Excel. Excel-like selection - Select a range of cells, rows, columns, and tables. The spreadsheet control also supports all keyboard interactions with cell selections. Cell comments - Supports importing, adding, editing, and deleting cell comments. Zooming - Zoom in and out of the worksheet content. Additionally, the zoom level can be imported and exported to and from Excel. Context menu - Built-in support for cell and tab context menus. Also support to add your own custom context menu items. Import and export data from various sources with the help of .NET Excel library (Essential XlsIO) as an intermediary. Insert, delete and rename - Insert and delete worksheets in a workbook. You can rename the worksheet by editing the UI or programmatically. Hide and unhide - Hide and unhide worksheets in a workbook. Gridlines - Customize the visibility and color of gridlines. Headings - Control the visibility of row and column headers in a worksheet. Protect worksheets with or without a password, and restrict user actions like row and column insertion, deletion, resizing, and more. Protect the structure of a workbook. Encrypt workbooks with a password to prevent users from opening them. PDF - Convert a spreadsheet workbook or worksheet to PDF format. Various customization options are provided, like embedding fonts, ignoring empty pages or worksheets, and showing or hiding headers and footers. Image - Worksheets can be converted to BMP, JPEG, PNG and other image formats, with content such as data, formatting, charts, tables, and shapes. HTML - Convert a spreadsheet workbook or worksheet to a HTML file. Print the spreadsheet workbook using PDF viewer. Localize all static text in the ribbon and built-in dialogs to any desired language.